Clean Exteriors Lead to More Business for Your Interiors! Don't let dirty awnings spoil it for your business. Let Fish Window Cleaning keep your exterior looking its best! 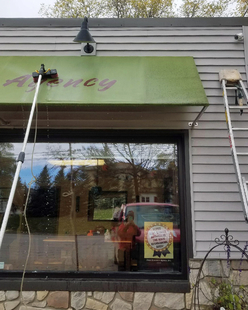 Awning cleaning is just one of the many additional services we have available. Pair it with sparkling clean windows, and your business will shine! With FISH, you only need to make one call. At work or home, you can rely on FISH to provide the professional expertise and service you expect. We are committed to your satisfaction! Call now or click the Free Estimate button below to request a free, on-site estimate now!